The apparently sensible response to this arbitrary exercise of authority has been the rise of public power and participation, which is something of a mantra among transportation planners. But while this is great in principle, there are some severe problems in practice. The first is actually getting the public interested. Here in Greenville, S.C., for example, public hearings about the long-range planning of the transportation system, which is presumably of considerable import, often attract attendees who can be counted on the fingers of one hand, despite herculean efforts to drum up interest. In such a situation, a handful of people who may have turned out because that night’s episode of Real Housewives of New Jersey was a rerun may have an outsized voice in making policy. Meetings about near-term, specific programs often don’t have this problem—in fact, they are sometimes swamped with eager attendees. However, this raises another problem: a small number of committed citizens can, and often do, stymie projects that would have very great benefits for the public at large. I say stymie projects, as opposed to promote them, because this is typically what happens. Economists have long noted that people are generally highly averse to change, no matter what that change is. They also hate losing much more than they enjoy gaining. Most people vastly prefer to avoid losing ten dollars than to get ten dollars, despite the fact that they are the exact same thing. People are also quite imaginative. So public officials who want to do anything at all are often bombarded with apocalyptic charges that a change to the transportation system, no matter how minor, will jam residential streets with a sea of traffic, result in cars parked on front lawns, generate earsplitting noise, block out the sun, invite armies of miscreants and criminals into the neighborhood, and result in boils, locusts, frogs, and slaying of the neighborhood’s firstborn. In contrast to the hyperbole about the costs, the potential benefits receive scant attention, even when the residents who are complaining would be the biggest beneficiaries of the accessibility the project will generate. For the relatively small number of airport neighbors, however, the costs—or at least the imagined costs—are great enough to prompt energetic lobbying. In turn, their elected representatives are willing to focus all of their efforts on blocking these projects, and are willing to horse-trade their votes on other issues to bring other legislators onboard. In addition to political lobbying, another favorite tactic is recourse to the legal system. Of course, the ability of citizens to seek restitution for harm is one of the great strengths of our system of government, but as we all know, it can also be badly abused. I once heard a talk from an activist fighting the expansion of Los Angeles’s ports, who boasted that her organization’s immediate response to any such project was the filing of a lawsuit based on California’s Environmental Quality Act. This person happily admitted that the actual merit of such suit was of little relevance, since even if it was ultimately unsuccessful it would have to be defended against, raising the project’s cost and delaying it long enough for opponents to dream up other obstructionist tactics. Contrast Los Angeles’s Harbor Freeway experience with the building of the Century Freeway a few decades later. For the Century Freeway, acquiring and clearing the land for the right-of-way took 20 years. The project faced numerous lawsuits from residents and pressure groups, resulting in ten years of delay and costly litigation. The suits were eventually settled with a consent decree that resulted in costs ballooning to $250m/mile (today’s dollars), well more than double what was initially forecast. 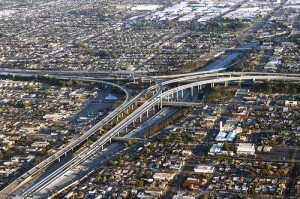 For these reasons, the era of building urban freeways is basically over. You may hate freeways, and consider this a success, and in some respects it is. But don’t forget that this same principle will stymie other interventions that might be more to your liking. For example, for reasons that are entirely unclear to me, residents of Beverly Hills have long blocked making the curb lane on Wilshire Blvd. a bus lane during rush hours, despite the fact that this would ease the lives of transit riders, help to get Angelenos out of their cars, and reduce traffic on Wilshire, of which Beverly Hills residents themselves are the biggest victims. Or maybe you simply don’t like transportation. But few stop to consider the mammoth cost of a world with no highways or airports. Their benefits are utterly taken for granted by most people, who grouse only about the system’s failings. Yet while I know of many passionate critics of the Interstates, I don’t know a single one who doesn’t travel on them. Past sacrifices were essential for today’s prosperity, but thanks to the current gridlock, we ourselves are now unwilling to make such sacrifices for future generations. There are certainly some modern-day examples of projects, like the Three Gorges Dam in China, which have had terrible environmental impacts and where the displaced residents (there were 1.24 million of them) should have had more of a voice. And okay, the solution here isn’t amending the Constitution to permit autocratic rule by Robert Mugabe. But it would be nice if our press and elected officials occasionally reminded us of the admittedly vote-losing proposition that the price of living in a community is that sometimes we all must tolerate some discomfort for the benefit of the polity as a whole. Also, in addition to blaming the easy targets of self-interested neighbors, parochial interest groups, and craven elected officials, it might behoove us to take a look in the mirror. The situation where the interests of the few are trumping the interests of the many exists because the rest of us are too uninformed and apathetic to participate in the process in an educated and energetic manner. Public participation can work, but only if the public actually takes the trouble to participate. In short, because of all the reasons defined here, the only say the public should have is at the ballot box. Also, not mentioned: the huge cost of public outreach that is spent. This would not be the case if the public wasn't able to file lawsuits, etc. One glaring omission from your analysis is the huge number of boondoggles resulting from pet projects and special interests. The big dog, bridge to nowhere, and probably California's new hsr are all government acting without input or oversight from the people. California's high-speed rail proposal was directly approved by a majority of voters in a high-turnout election. That's a poor example of something that is allegedly "without input or oversight from the people". Hard to say it was approved when "Soon after passage of the initiative in 2008, cost estimates almost tripled, ridership projections fell significantly, and the estimated time of travel along the length of the project doubled." I sure hope we get there soon! I think you are building a case on a very shaky foundation: the idea that losing and gaining something are exactly the same. Suppose I have $10, and that's enough to feed me until Friday (I know how to eat cheap :-)). Lose that $10, and I go hungry; gain an additional $10, and I still eat. Same with the alleged benefits of those transportation problems. I stand to lose much that I value, while the gains - if not siphoned off by a small clique of developers and politicians - even if of equal dollar value, are seldom a true replacement for what's lost. Mr. Morris should have expanded his metaphor. Image these two scenarios. In the first scenario, I give you a $10 and have you flip a coin. If heads, you keep the $10; tails you lose it. In the second scenario, you flip a coin first. If heads, you win $10; tails, you get nothing. These two scenarios have the exact same odds of you ending up with $10. But people prefer the chance of winning something in the second scenario to the chance of losing something in the first. The situation you describe is not parallel to Morris' example, where people are asked to give up something of value now in hopes of some (hypothetical) future gain. The problem is one of objecive versus subjective value: a bowl of rice might cost a dime, but its value to a starving man is not the same as to the man who's just finished a 12-course dinner. The explanation for Beverly Hills is quite simple. The city simply doesn't want to encourage mass transit at all. It is not in their best interest. The same thing happened in parts of the united states at the end of the 19th and early 20th centuries. Companies began to build horse drawn rail lines. Since the cars were on rails a single horse could pull an enormous load. As a result the cost of tickets for these cars was low. This became the transportation of choice for the working class. As a result working class neighborhoods clustered around these horse drawn rail lines. Wealthier portions of town passed laws forbidding the laying of tracks necessary for this early form of light rail. As a result the only public transit available was the far more expensive omnibus. Thus, the working class avoided neighborhoods with that form of transit. Beverly Hills is simply following in this earlier form of exclusion. You'll also find that Beverly Hills has no desire to build light rail, or subway lines through their city. Simply put, they don't want the riff raff coming to visit. The California High Speed Railway proposition was approved by the voters and certain conditions were promised/specificed (such as costs and transportation time) and both clearly will not be met, so it was sold either with lies or wrong assumptions, and should be stopped before this boondoggle costs even more. This is why the public is hesitant to approve some projects- we cannot trust the people in charge of keeping their word. 100,000's of people got to work quicker per year for 70+ years. That's such a tragedy. Maybe those protesting it should have to take a horse and buggy to work. From my own experience of freeway commutes, I would seriously doubt that millions of people get to work quicker* than they did 70 years ago. Most often, transportation projects seem to just create a vicious cycle: the new congestion-relieving roads &c cause more people to move to the area, and to live further from work, resulting in a net increase in average commute time. This is a rant much more than a reasoned argument. Note the use of an extremist anecdotes (filing frivolous lawsuits and the 3 Gorges Dam) rather than actual data to make certain key points. It also uses a ridiculously simplistic economic argument that more (or faster) is always better, completely ignoring the context of specific projects. It's also completely glosses over the fact that what is lost is often not of the same type as what is gained (jobs, economic activity, property values, quality of life). Really not worth reading, but given that it is featured on Freakonomics, certainly worth criticizing. All and all, this piece is pretty weak. "The first is actually getting the public interested... attract attendees who can be counted on the fingers of one hand, despite herculean efforts to drum up interest." You mean long-term transportation projects, programs, and policies are a low-salience issues? Look, you can't bemoan the lack of interest and then claim that (this is a big generalization of your point) "Democracy is useless here". People in your neck of the woods just don't care about it. Maybe YOU should do some encouraging of people to care about it if you want others to care. You wouldn't see a single non-profit go "Nobody cares about us, guess we should even bother working with people". "...a small number of committed citizens can... stymie projects that would have very great benefits for the public at large." "Most people vastly prefer to avoid losing ten dollars than to get ten dollars, despite the fact that they are the exact same thing." There we go. Because future transportation system benefits are exactly like in-person cash transfers. I think they should be compared to building professional sports arenas. Let's keep that idea in mind for the rest of my comment. "People are also quite imaginative... In contrast to the hyperbole about the costs, the potential benefits receive scant attention, even when the residents who are complaining would be the biggest beneficiaries of the accessibility the project will generate." "The problem is that few of those future travelers or residents of the region are going to turn out at public meetings or bombard legislators with emails and calls, because the benefits, though widespread, are hard to conceptualize." "Hard to conceptualize"? How about "they are primarily received by people who don't live in the constituency"? It isn't that people don't recognize the benefits of improved transportation infrastructure, it is that they have to bear a cost that will net a benefit to people who can be categorized as "not them". Maybe that is why it is so hard to sell the bill when you don't get to eat the dinner? Combine this with my previous point and you start to see why people resist taking on costs for unsure benefits. Burn them on enough stadium deals and people start to wise up. "For the relatively small number of airport neighbors, however, the costs—or at least the imagined costs—are great enough to prompt energetic lobbying." Ok, now you are just getting ridiculous. Now you are asking people to take on a massive cost (destroyed home equity) AND not be vocal complainants. These aren't "imagined" costs. People living near flight paths and airport entrances have had their home values destroyed. With mortgage payments still to make. In fact, many cities end up buying massive amounts of land near airports to prevent people from having to endure that very real loss. Look, I'm not going to go through the rest of this, but let me summarize it here: Democracy and public participation is a problem, unless people are energetic and engaged, and then it is good. Come on man. I got to your ending and you know that is a cop out. You can't bemoan the lack of Chinese citizens having a say and then dislike the tactics of those who express their energetic and engaged voices. At the end of the day, this reads like a "I don't want to hear from anyone who disagrees with me, and more people who agree with me should be vocal." I guess you really don't want to bother with democracy. I think you have made good points and the author has some good points. What is needed is balance. To build a multi-billion HSR you need and deserve a lot more studies and comments and input from many parties, including those most directly affected. Unfortunately, in many cases, the same (or greater) level of public involvement is required for relatively minor projects and often out of town, out of state and out of region groups block or force projects that do not help (or directly harm) those closest to what is being proposed. We are crippled by talk radio lies that are against any action for the public good. What this essay really shows is that using political means can sometimes go in ways you like and sometimes in ways you don't like. It can be because some minorities are more vocal, or because the majority is mistaken, or due to artifacts of the system (voting method, horsetrading, etc). Yet more public-choice reasons to minimize what is managed through politics. Politics does not improve on our ability to resolve disagreements (compared to property rights and private exchange) , it just opens up more conflicts: you get to chime in on every action of your neighbor, which is in a sense broad collective ownership. That naturally leads to gridlock and abuses (tragedy of the commons). It does not offer a way to rationally decide what is "worth it", as many of the costs are ignored or born involuntarily. While I agree that past sacrifices (more correctly saving and investment) are the driver of development, it is not that clear that people in the past agreed to those government-mandated sacrifices. Celebrating those public projects as progress is less than rigorous economic analysis. I disagree that public meetings, in many cases required by law, are broadcast with "herculean effort" to attract citizen input. Having attended many of them personally, they are usually just formalities used to sell the governing body's concept of how the plan should be executed. Interesting that this sort if article is being written. I don't agree, but I guess I think that there is a kind of moaning masses factor in public policy today. In the UK the government seems so sick of the middle class hobbyist campaigner that they put through a bill recently to try and shut them up (which was amended but didn't pass). I think the real issue is that the corporations (try to)take so much power from the people that good people end up as bitter moaners without really knowing what is really going on. When the next economic crisis comes hopefully people will start waking up to their responsibilities. So let's not have a go at folk for opposing, just keep an eye on the big picture. « Previous PostDoes Breastfeeding Reduce Childhood Disability?